Previous post: What If There Were No God? Today is my seventy-first birthday. Funny, I never imagined myself as seventy-one. Old people are achy and wrinkled but I couldn’t imagine it would happen to me. Old people are forgetful and love thinking about the “good old days.” But me? Yep. The Dave Shultz of 1962, the year I graduated from high school, could not have imagined my life today. But here I am, and here you are, changed, different, learning to adjust. And don’t get too comfortable, because more changes are on the way. “Change is the only constant in life” was first penned by Heraclitus, an ancient Greek philosopher who lived about 500 years before Christ was born. Apparently the ubiquity of change hasn’t changed! In this everything-is-changing environment, many say that the church also needs to change, perhaps even that Christian beliefs should change. What, exactly, does that mean? What should change? And what should not? Jesus came to proclaim the Kingdom of God. One of its fundamental characteristics is that it does not change. Imagine! In an environment of chaos, there is something eternal, everlasting, and altogether predictable. When we get up every morning we have no ideas what changes will come that day. The dog may throw up on the carpet. We may meet the person we’ll marry. You just never know. Wouldn’t it be good news to have something that is ageless and utterly dependable? We do: God’s Word. Yet many question whether there is absolute truth anywhere. I choose to believe what God’s Word says about itself and what Jesus says about it. The Psalms declare, “The grass withers and the flowers fall, but the word of our God endures forever.” John’s gospel tells us that Jesus is the living Word of God and Hebrews proclaims that “Jesus Christ is the same yesterday and today and forever.” If you choose to believe this, you are also choosing to believe that Christ and His Word are unchangeable and eternal. I’m taking the time to lay this quick foundation because it is absolutely essential that we Christians comprehend and embrace it. If we don’t, we’re toast. 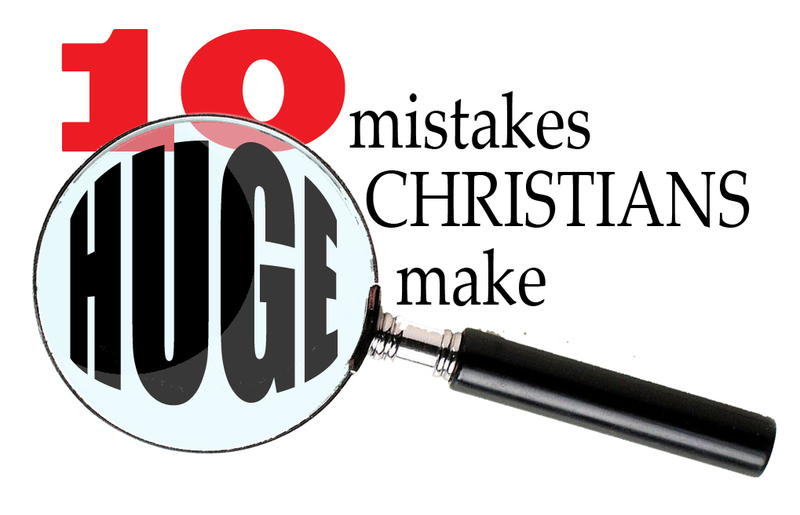 Here are ten huge mistakes Christians are making. Christians are in trouble if we don’t know what the Bible says. It is astonishing how few Christians have committed any verses to memory. Many could not tell you how many books are in the New Testament or what they are. We confuse the Bible with colloquial proverbs like, “God helps those who helps themselves.” Many would be hard put to turn to any verses that explain their own salvation. We know it’s in there, but we’re not sure where. Do you read the Bible regularly? Have you read through the Bible? What did Jesus teach about Himself? The Bible is eternal and provides the only sure hope for our future. We ignore it at our peril. Mistake Number 2: Substitute Reason for Faith. Mistake Number 3: Fail to form a personal relationship with God. In every church I’ve pastored there were people who had no idea this was even possible. For them Christianity was keeping the rules and trying to be good. How tragic! Mistake Number 4: Pick and choose what you like about Christianity. Large congregations of Christians meet every Sunday firmly believing that if they serve God that he will bless them with money and cars. Or that every Christian will be healed. Or that Jesus loves people so much that He will abandon the whole redemption thing and just take us all to heaven. Thomas Jefferson, one of our founding fathers, believed that God had created the world but no longer intervened directly in daily life. “In fact, Jefferson was devoted to the teachings of Jesus Christ. But he didn’t always agree with how they were interpreted by biblical sources, including the writers of the four Gospels, whom he considered to be untrustworthy correspondents. So Jefferson created his own gospel by taking a sharp instrument, perhaps a penknife, to existing copies of the New Testament and pasting up his own account of Christ’s philosophy.” Sad that such a brilliant man thought he knew more about the Bible than those who were eyewitnesses to Jesus Christ and his teaching! Are we doing the same thing? Fornication is practiced by unbelievable numbers of Christians. And what is fornication? Sleeping with anyone to whom you are not married. The Bible says it is a sin, period. Society says it isn’t. So we cut out the part of Scripture that condemns our lifestyle. A few years ago we met a couple who, like us, were new in town and looking for a home congregation. They stayed a few months and left. We run into them now and then, but they have stopped looking. The husband who, according to his wife, “studies Greek and Hebrew,” can’t find a church worthy of them. Really? One gets the idea that he would advise Jesus on his theology. Finding a group of Bible-believers and meeting with them regularly is essential to your faith. We need the messages (even if they don’t meet our lofty standards), the singing, the scripture, and the fellowship. We need people to pray for us and we need to pray for them. Christians are the body of Christ. If my hand were chopped off it would die without the body to sustain it. We need the discipline of getting up and by so doing tell ourselves that our faith is as important as going to work or watching the Pittsburgh Steelers.